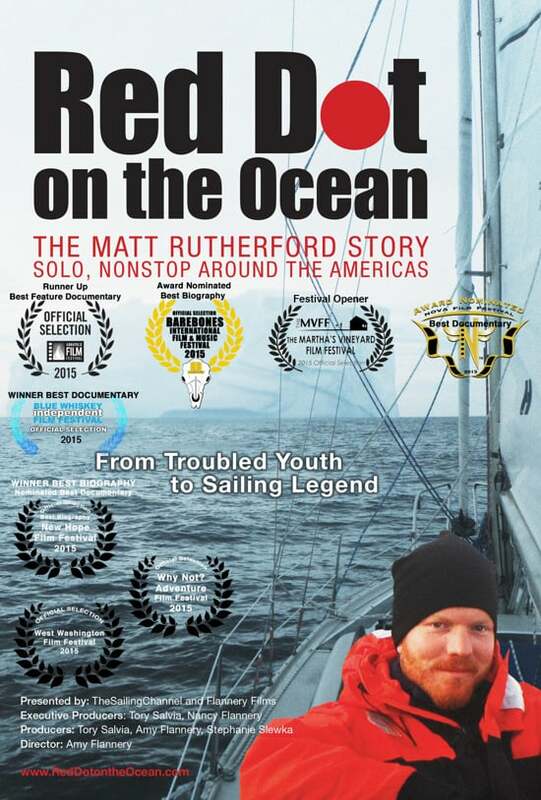 Once labeled a “youth-at-risk,” 30-year old Matt Rutherford risked it all in an attempt to become the first person to sail alone, nonstop around North and South America. In June 2011, Matt departed on an incredible, death-defying voyage to sail nonstop around the Americas. On St Brendan, Albin Vega #1147, an old, scrappy 27-foot sailboat he spent the next 309 days alone at sea. He braved the icebergs of the Arctic and the treacherous waters off Cape Horn. 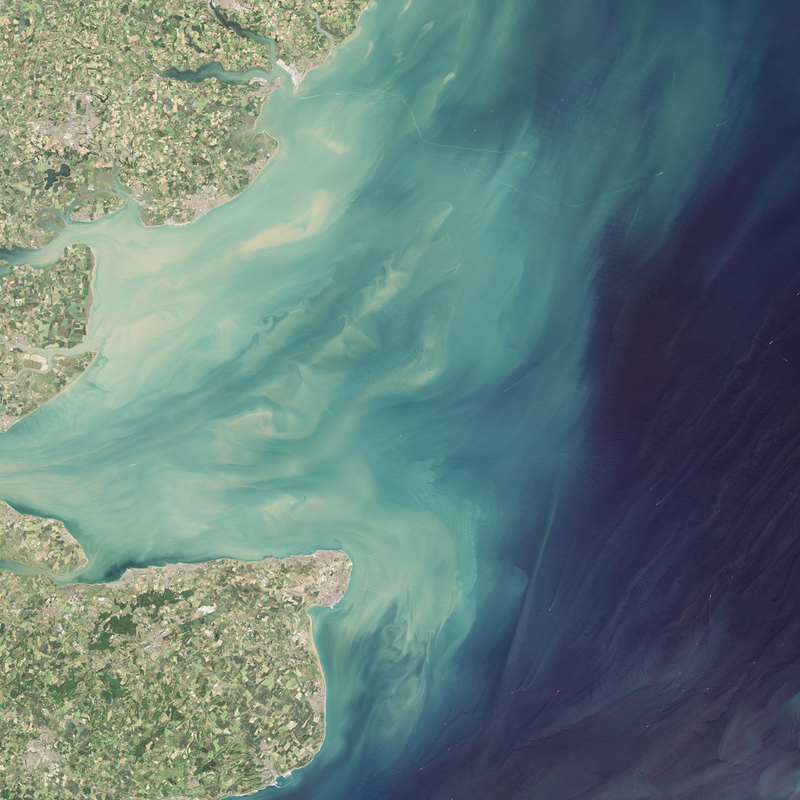 For at least the past decade, satellites have spotted white dots cropping up in the North Sea. 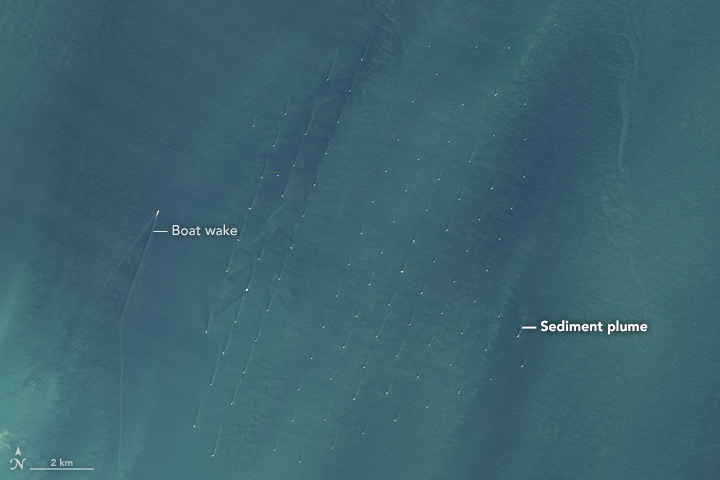 If viewed from Earth’s surface, you would see that these dots are actually wind turbines—huge arrays of towers rising from the sea and topped with electricity-generating rotors. But they’re doing more than harvesting the wind. They appear to also be giving rise to sediment plumes. 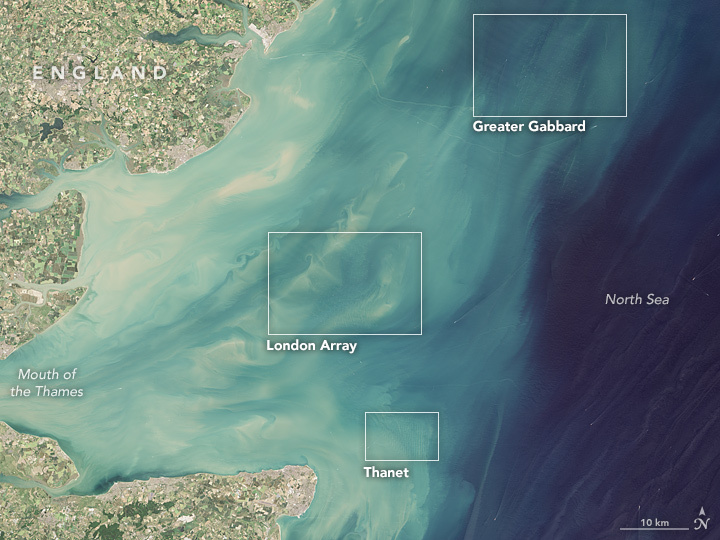 Some of the North Sea’s most expansive arrays are visible in these images, acquired on Jun 30, 2015, with the Operational Land Imager (OLI) on the Landsat 8 satellite. When these images were acquired, there were 84 offshore wind farms in Europe (including some under construction). The North Sea accounts for the most offshore wind capacity—69 percent—in European seas, followed by the Irish Sea and Baltic Sea. The turbines were built to take advantage of high winds blowing over the North Sea’s surface. The London Array, visible in the first detailed image, spans 100 square kilometers (40 square miles). 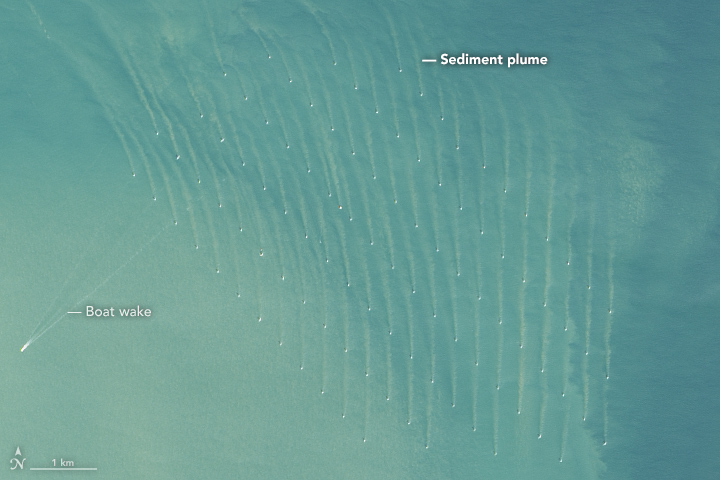 The wind farm, which first became operational in 2013, sits on two natural sandbanks in water as deep as 25 meters (80 feet). The site was chosen because of its proximity to onshore electric power infrastructure and because it is beyond the main shipping lanes through the area. Other significant wind farms, Thanet and the northern half of Greater Gabbard, are shown in the second and third detailed images. 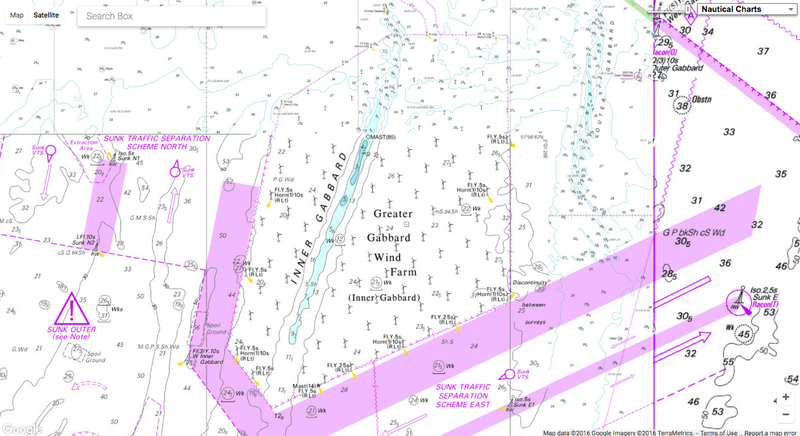 Thanet spans 35 square kilometers (14 square miles) and sits in water measuring 20 to 25 meters deep; the entirety of Greater Gabbard spans 147 square kilometers (57 square miles) and sits in water 24 to 34 meters deep. 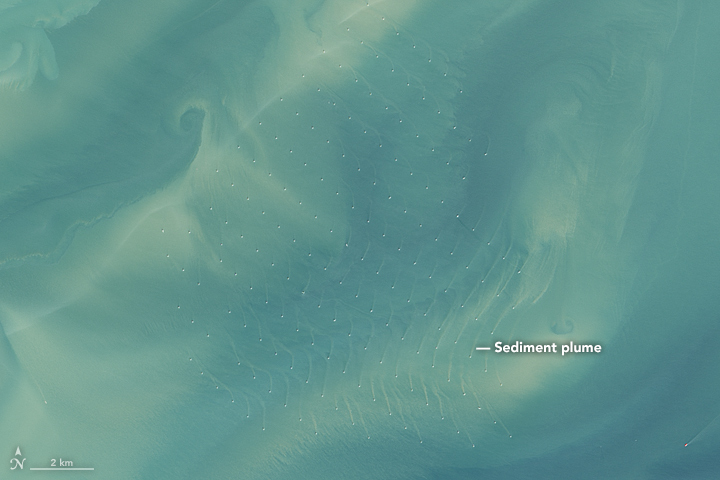 But the environment below the water’s surface can also feel the presence of the turbines. The detailed views reveal light-brown plumes of suspended sediments extending from each tower. In a 2014 paper, researchers analyzed satellite imagery and found that the wakes (and plumes) can measure anywhere from 30 to 150 meters wide and up to several kilometers long. “The fact that the wakes are browner than the surrounding waters shows that they contain more suspended sediments,” said Quinten Vanhellemont, a researcher at the Royal Belgian Institute of Natural Sciences and lead author of the 2014 paper. Vanhellemont explained that the wakes are generated by the tidal current moving around the foundation of the turbine. The direction and curvature in the wakes are related to the general direction of the current. 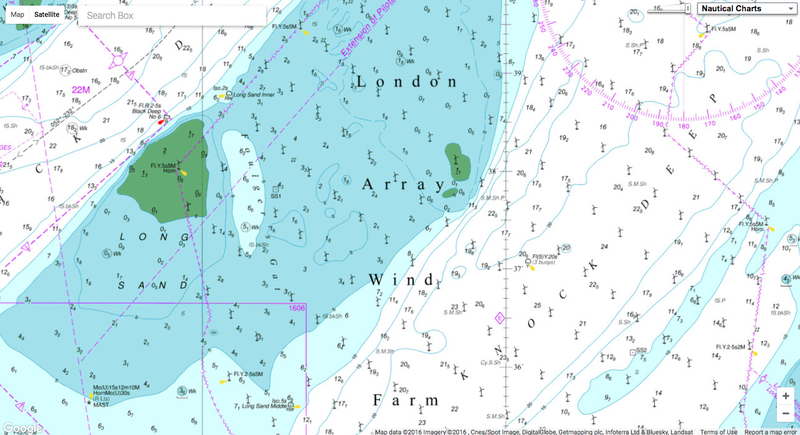 For example, the image of the London Array was acquired during flood tide, so the wakes follow the northward current. It’s not yet clear how these changes in sediment transport could affect the relatively shallow underwater environment, which is known to be an important fish nursery. According to Vanhellemont, researchers at the University of Hull are currently studying the wakes in greater detail by investigating their 3D structure. The European and Wind Energy Association (2016, July) The European offshore wind industry—key trends and statistics 1st half 2016. Accessed November 7, 2016. The European and Wind Energy Association (2016, February) The European offshore wind industry—key trends and statistics 2015. Accessed November 7, 2016. 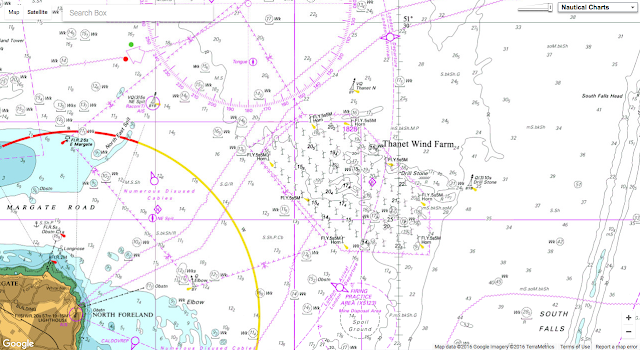 LORC List of Offshore Wind Farms. Accessed November 7, 2016. USGS Landsat Missions Image Gallery (2016, September 27) Landsat Confirms Spatial Extent of Wind Tower Sediment Plumes. Accessed November 7, 2016. Vanhellemont, Q. and Ruddick, K. (2014, April 5) Turbid wakes associated with offshore wind turbines observed with Landsat 8. Remote Sensing of Environment, 145, 105-115. Birds and other marine creatures ingest plastic and this can lead to damage to internal organs, gut blockages or chemical build-ups in tissues. The study found that drifting plastic waste accumulates algae and gives off a smell very similar to the krill that many marine birds feed on. The findings could explain why certain birds - including albatrosses and shearwaters - which rely on their sense of smell for hunting, are particularly vulnerable to swallowing plastic. Matthew Savoca, the study’s lead author at the University of California Davis, said: “Animals usually have a reason for the decisions they make. The rate of plastic pollution is steadily increasing worldwide, with one study last year estimating that about eight million metric tons of plastic - enough to cover every foot of coastline in the world - is enters the oceans annually. It is known that birds and other marine creatures, including turtles and fish, ingest plastic. This can lead to damage to internal organs, gut blockages or build-ups of chemicals from the plastics in the animals’ tissues. Previous studies have shown that some birds feed their young bits of waste - presumably mistaking it for food. To investigate what attracts birds to debris, the scientists put beads made from the three most common types of plastic - high-density polyethylene, low-density polyethylene, and polypropylene - into the ocean at Monterey Bay and Bodega Bay, off the California coast. The beads were sewn into mesh bags and tied to buoys to avoid any of them being eaten by wildlife. Three weeks later, the beads were collected and the smell they gave off was analysed at the UC Davis Robert Mondavi Institute for Wine and Food Science, where scientists normal focus on the chemistry behind the flavour and fragrance of wines. The plastic was found to give off a sulfur compound, dimethyl sulfide (DMS), linked to the algae which coated the floating plastic. The same team had previously shown that DMS is the chemical cue that triggers certain seabirds to forage for krill - or as the scientists put it “the birds’ version of a dinner bell”. It is this cue that is being hijacked by the plastics. The world ocean's food chain is being polluted with plastics. This program has won the Ocean Film Festival Award of Excellence at the NOAA sponsored Gray's Reef National Marine Sanctuary film festival. In a second piece of analysis, using data from 55 studies and 13,315 birds, the scientists showed that seabirds that track the scent of DMS to find prey - a group known as tube-nosed seabirds and which includes albatrosses, petrels, and shearwaters - are nearly six times more likely to eat plastic than other birds. Birds could be better protected in future, the scientists argue, by creating plastics that do not accumulate algae as readily in the sea. Berry Mulligan, international marine programme officer at the Royal Society for the Protection of Birds, said: “While research such as this is raising the alarm about plastics in our oceans, it is hard to realistically estimate the magnitude of the problem for seabirds at a global level. The Conversation : The oceans are full of plastic, but why do seabirds eat it? Christian Science Monitor : What makes plastic debris seem so tasty to seabirds? 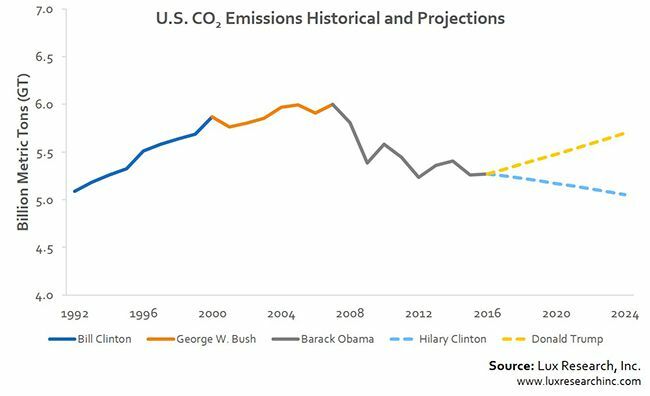 A new study by Lux Research projects that Trump would reverse eight years of declining emissions under the Obama administration. Climate experts who have been nervously watching the US election from the UN summit in Marrakech will now go into crisis mode at the news that Donald Trump will be the next President of the United States. 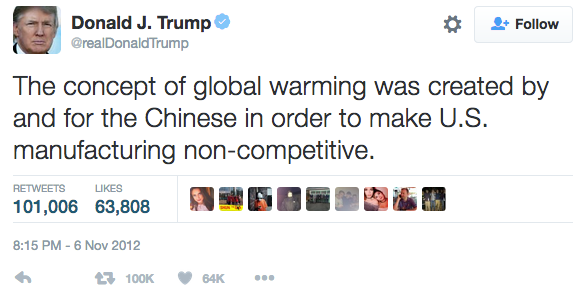 Many attendees stayed up through the night to find out whether a man who has previously described “the concept of global warming” as being “created by and for the Chinese” will be named the most powerful leader in the world. The Morocco summit has seen representatives from around the world gather to discuss how last year’s groundbreaking Paris Agreement will be implemented in practice. But Mr Trump has previously stated that he wants to dismantle the accord, which aims to limit global warming to within 2C, suggesting the US should not waste "financial resources” on tacking the issue. The new US President has tweeted dozens of times about how he does not accept the overwhelming scientific evidence that man-made climate change is real. The issue of climate change came up only once in the three live US presidential debates between Mr Trump and his defeated opponent Hillary Clinton. 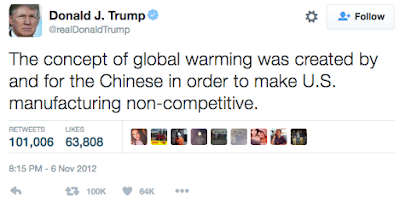 Whether this gives hope to climate experts that Mr Trump could change his position, or concern that the new US President would say something evidently untrue on live TV, remains to be seen. How will President Trump impact the climate? Patricia Espinosa, the UN’s top climate official, said last month that there was “no plan B” for the event of a Trump presidency. Speaking to Climate Home, she admitted the US election result would have serious “implications” for how the world tackles dangerous climate change. But climate officials have also been bullish since the start of the COP22 summit, saying there is no going back on the Paris Agreement. “I think everyone in the world is following the election process because of the implications, and we are vigilant, but it’s important to bear in mind the Paris Agreement has an incredible amount of legitimacy,” Ms Espinosa said. In a report released at the summit on Tuesday, experts warned that the global climate had shown an "increasingly visible human footprint” in the last five years. The World Meteorological Organization, the UN’s weather agency, said 2011-2015 was the hottest five-year period on record, and that many extreme events during the period were made more likely as a result of man-made climate change. "The evidence is overwhelming," said Chris Field, director of the Stanford Woods Institute for the Environment. How possible that is, with Donald Trump as US President, remains to be seen. 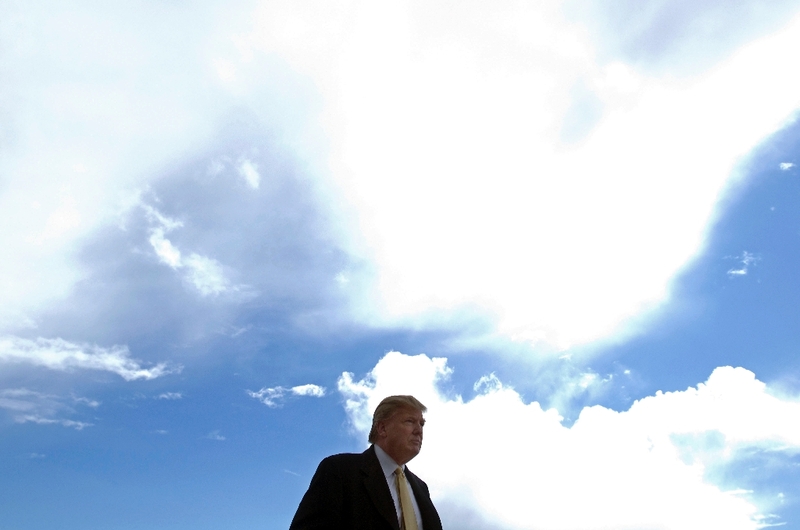 Law Street : Where Does Donald Trump Stand on Environmental Policy? Quartz : Trump has vowed to yank the US from the global climate pact. He can do it. U.S. Naval officer Silas Bent used this 1872 map to claim that the Gulf Stream and other warm currents fed an open sea around the North Pole. This 1563 map by Giovanni Ramusio and Giacomo Gastaldi was the first accurate map of the Americas sold commercially, but the blank areas at the poles reflect the lack of geographical knowledge at the time. It had to be there: an ocean at the top of the world. The ancient Greeks drew it on their maps, and for centuries, the rest of Europe did too. Beginning in the 1500s, countless men died trying to find it, hoping for a maritime shortcut across the Arctic that would open up new trade routes to Asia. Now, thanks to a warming planet, the long-sought Northwest Passage actually exists … at least for part of the year. Sea creatures abound in this 1598 map by the Dutch explorer Willem Barents. He drew it while stuck in sea ice on his third trip to the Arctic. The idea of a northern ocean passage dates back at least to the second century A.D. Ptolemy and the ancient Greeks believed that Earth had four habitable zones balanced by two uninhabitable frigid zones—often thought to be water—at the top and bottom of the globe. But it wasn’t until the early 16th century, after the voyages of Columbus, that the idea of a Northwest Passage really took hold in the popular imagination of Europeans, says Ian Fowler, the library’s director. Columbus, after all, had sailed west looking for a sea route to the East. Instead, he found a continent blocking the way. This 1633 map by Gerhard Mercator depicts the North Pole as a massive rock surrounded by water. The Northwest Passage would be a way around this continent. This 1645 map by Willem Blaeu incorporates new information from exploratory expeditions, but its depiction of Greenland connected to mainland North America runs counter to the idea of a Northwest Passage. There was also a lot of gamesmanship and outright deception in the maps. The map above comes from a book published in 1558 to describe the travels of two Venetian brothers in 1380. The story is almost certainly bogus, Fowler says, made up in an attempt to retroactively claim the discovery of the New World for Venice. Even so, the map was widely copied and may have led some expeditions astray. Colored clouds represent the northern lights near the center of this 1709 map by Jacques Peeters, which, unlike many maps of its time, includes only geographical features that were confirmed by explorers. This detail from Peeters’ map (previous image) includes notes on parts of the Greenland coast surveyed by different explorers, as well as a dotted line (on the coast, near the center) to indicate an area of geographic uncertainty. Early explorers also occasionally played fast and loose with the facts. The Englishman Martin Frobisher made three voyages in search of the Northwest Passage in the late 1500s. “He discovered some straits, pretended to find a lot more,” Fowler says. On one trip, he returned to England with tons of what he claimed was gold-containing ore. It was enough to convince his backers to fund another trip, but it ultimately turned out to be pyrite—fool's gold. This 1713 map by Jean-Dominique Cassini was the most scientific map of the world in its day. It draws on the observations and measurements of many explorers and depicts two possible routes for a Northwest Passage. With time, and additional exploration, the maps got better. This detail showing the Bering Strait comes from a 1784 map by Captain James Cook that was the first printed map to accurately depict the west coast of North America (on the right side). In contrast to a Russian map printed the same year (further down in this post), it has relatively little detail of the Siberian coast (on the left). The map below, published in Russia in 1784, was the first to show details gleaned from a large and highly organized survey of the Arctic coast of Siberia. It depicts a possible Northwest Passage: On the far right side, "R. de l'Quest” connects Hudson Bay to the Pacific Ocean. Notice the level of detail on the Asian side of the Pacific compared to the North American side—the situation is reversed in a map published the same year based on Captain James Cook’s exploration of the coast of Alaska (see slide nine in the gallery above). Perhaps the most famous attempt to find the Northwest Passage was the expedition led by Sir John Franklin in 1845. Franklin was an officer in the British Navy who had led two previous expeditions to the Arctic. But this time the expedition didn’t return on schedule, and Franklin’s wife, Lady Jane, began pressing the British government to send a search party, which they did in 1848. The search grew to include more ships over the coming years, and newspaper reports on the hunt for the missing expedition gripped the British public. Ultimately, though, all the searchers found were several graves of men who’d died early on and a few scattered notes and other relics. The two boats in the expedition had become trapped in ice, and all 129 men, including Franklin, perished. The second of his two boats, the H.M.S. Terror, was finally located only a few weeks ago. Unbeknownst to Franklin and other explorers, their expeditions coincided with what scientists call the Little Ice Age, a period of several centuries of unusual cold in the Arctic. Published in 1868, this German map portrays a (nonexistent) land bridge stretching across the Arctic from Greenland. The red line coming up from the bottom is the mapmaker’s suggested route for an expedition. As temperatures began to climb toward the end of the 19th century, the long-sought Northwest Passage finally opened up. The Norwegian explorer Roald Amundsen completed the first journey entirely by boat through the Northwest Passage in 1906. It took three years and two winters on the ice. More recently, it’s been getting easier. As polar ice has melted, the route has become more accessible. Last month a cruise ship carrying 1,700 people became the first passenger liner to complete the passage. The melting of Arctic sea ice has raised the possibility of new trade routes and energy production, as well as the potential for territorial conflicts and environmental damage to a relatively untouched part of the Earth. represents a more modern look at the Arctic. The sound appears to come from the sea floor in Hecla and Fury Strait. 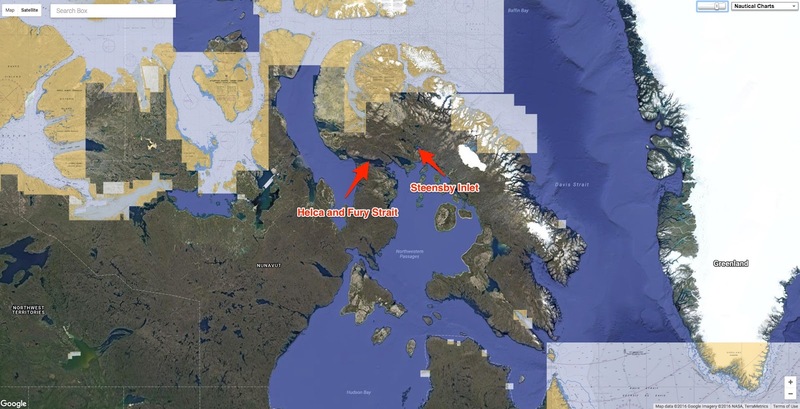 Northeast of Igloolik is Steensby Inlet, where Quassa says Baffinland, owner of the Mary River mine, has been doing sonar surveys. The company says it has no equipment in the water. 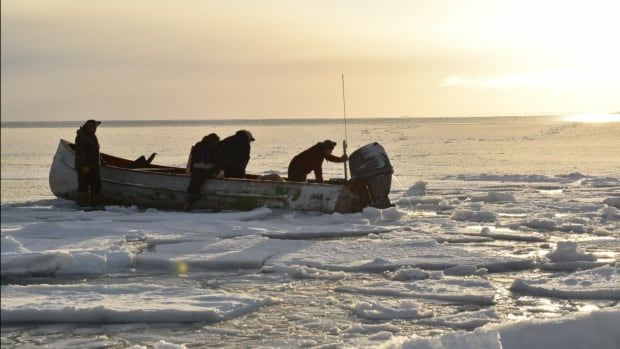 The "pinging" sound, sometimes also described as a "hum" or "beep," has been heard in Fury and Hecla Strait — roughly 120 kilometres northwest of the hamlet of Igloolik — throughout the summer. Paul Quassa, a member of the legislative assembly, says whatever the cause, it's scaring the animals away. "And this time around, this summer, there were hardly any. And this became a suspicious thing." The noise is "emanating from the sea floor," according to remarks Quassa made last month in the Nunavut legislature. Another area MLA, George Qulaut, said he visited the site after hearing the reports. Though he wasn't able to hear the sound — he says years of hunting have left him nearly deaf, especially to high-pitched sounds — he did notice the lack of wildlife. "That passage is a migratory route for bowhead whales, and also bearded seals and ringed seals. There would be so many in that particular area," he told CBC News, recalling his own days of hunting there. Boaters aboard a private yacht passing through the area also say they heard the mysterious sound, and described it during an appearance on a community radio show upon their arrival in Igloolik. A number of people called in to say they'd also heard it. The noise can apparently be heard through the hulls of boats. CBC News has not heard the noise and did not speak to anyone who claims to have heard it. Hunters pack their boat from the shore in Igloolik. The mysterious sound has been noted by hunters in the area of Hecla and Fury Strait, a rich hunting ground that they say was empty this year. Nobody seems to know where the sound comes from, but theories — from environmental activists to mining — abound. One theory blames Baffinland Iron Mines Corporation. The company has previously conducted sonar surveys of nearby Steensby Inlet in conjunction with its Mary River mine southwest of Pond Inlet. But the company told CBC News it is not conducting any surveys in the area, and has no equipment in the water. Quassa says no territorial permits have been issued for work — such as construction, blasting or hydrography — in the area that could explain the noise. He also says some of his constituents suspect the sound is being generated on purpose by Greenpeace to scare wildlife away from the rich hunting ground. The organization has a tense past with Inuit stemming from its opposition to the seal hunt in the 1970s and 1980s. "We've heard in the past of groups like Greenpeace putting in some kinds of sonars in the seabed to get the sea mammals out of the way so Inuit won't be able to hunt them," Quassa said. These rumours, though persistent, have never been substantiated. 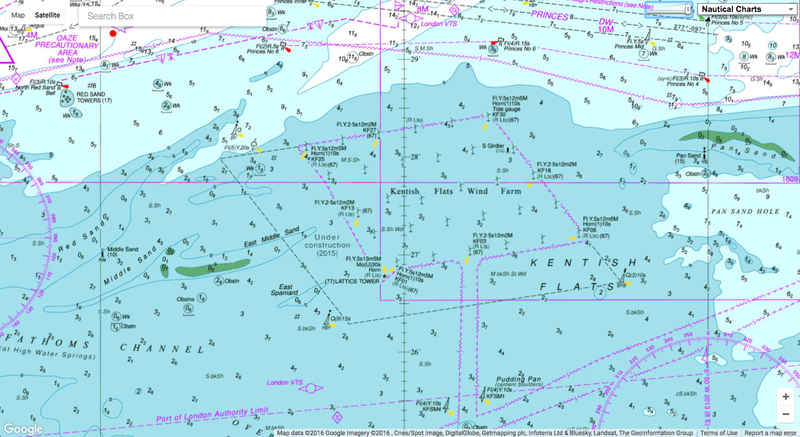 "Nobody has ever seen any type of ship or anything going through that area and putting something down," Quassa said. "Not only would we not do anything to harm marine life, but we very much respect the right of Inuit to hunt and would definitely not want to impact that in any way," Farrah Khan, a spokeswoman for the organization, said from Toronto. The military is also aware of the noise, and says it is looking into it. Internal correspondence between sources in the Department of National Defence, obtained by CBC News, suggest submarines were not immediately ruled out, but were also not considered a likely cause. A spokesperson told CBC News the armed forces are investigating. "The Department of National Defence has been informed of the strange noises emanating in the Fury and Hecla Strait area, and the Canadian Armed Forces are taking the appropriate steps to actively investigate the situation," a spokesperson wrote in a statement. Igloolik is about 70 kilometres north of Hall Beach, an active military site that was once part of the now-defunct DEW line of radar stations. In the meantime, Qulaut is worried about the sound's impact on game animals that have been feeding in the area for centuries. For now, the community has no answers about the sound, its origins, or what it might be doing to the animals. "As of today, we're still working on it," he said. "We don't have a single clue." Best of luck, fair winds and following seas to all Vendée Globe skippers as they depart today! 29 men from 10 countries sailing alone around the world, without any stop.